As the University gets closer to unveiling the Science and Engineering Hall, GW officals have announced that they will not discuss how much money they have raised for the building's construction costs. The University had raised just 9 percent of what it hoped to raise toward construction as of last November. 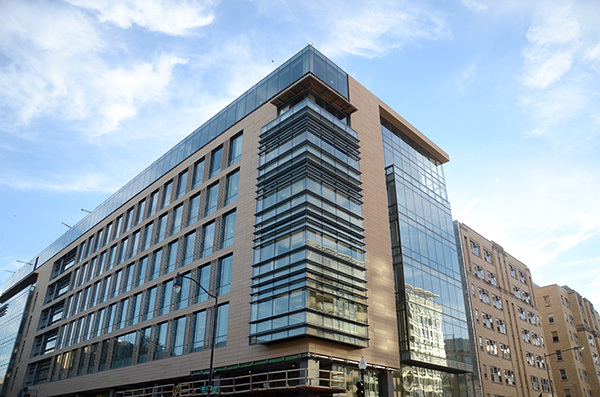 When officials unveil the University’s biggest academic investment in its history this spring – the $275 million Science and Engineering Hall – faculty leaders won’t know how much money GW still needs to raise. After struggling to pull in money to cover construction costs for the project, GW will no longer disclose how much funding it has secured. Professors have for years casted doubt on plans to heavily invest in science and engineering programs, while scrutinizing how the University will pay for the new building. GW’s tight-lipped approach fits into the well-oiled messaging machine behind its $1 billion fundraising campaign. Specifics about which donations are for building construction or programs and scholarships will not be shared as officials look to keep the message centered on campaign goals, University spokeswoman Maralee Csellar said. Csellar said if officials released specific details about the project, it would be too “in the weeds.” The University now hopes to bring in a total of $100 million for construction as well as for research, scholarships and professorship funding for the programs housed in the building, she said. Officials have said that they will rely on a combination of subsidized research dollars and fundraising, and will also pay off the building’s costs in the long-term through debt. As recently as one year ago, administrators changed their plans from fundraising $100 million to cover a large portion of the building’s construction costs, to hoping to receive $75 million from a combination of fundraising and government subsidies for research. They said that mix would take pressure off the University’s fundraising arm as it struggled to raise money for materials and labor costs. “We’ve launched a campaign, we have these goals and these are the public figures. The process was different before because there was no campaign,” Csellar said. The University had brought in just 9 percent of the $75 million it was hoping to raise from outside sources for construction by last November. At that time, Vice President for Development and Alumni Relations Mike Morsberger said he was disappointed in the total. So far, the University has raised about $43 million total for the project, with about 30 percent of that amount coming in the last fiscal year, Csellar said. She declined to specify what portion of that money is for construction or programs. The University had pulled in just 9 percent of the money it had hoped to raise from outside sources by last November. Vice President for Development and Alumni Relations Mike Morsberger said at the time that he was disappointed in the total. Donald Parsons, an economics professor and member of the Faculty Senate’s finance committee, said the “total failure” of fundraising for the building may contribute to the University’s shift toward silence. “I think they are sufficiently embarrassed that they decided no longer to expose themselves to ridicule,” Parsons said. Over the past several years, GW has continued to redraw its plans for paying for the hall. It refinanced its debt in 2013 to take on $200 million of the building’s costs. As recently as this summer, officials issued $300 million in bonds to help pay for several construction projects across campus, though they did not say which amounts would go where. Faculty leaders have questioned the need for an engineering hall over the past several years. The Faculty Senate has asked whether it was worth pouring money into programs that GW is not as well-known for, compared to its traditionally strong areas like political science and international affairs. The governing body, which listened to some of the first pitches for the building about a decade ago, will ask for another fundraising report at its December meeting, said Charles Garris, an engineering professor and the chair of the Faculty Senate’s executive committee. 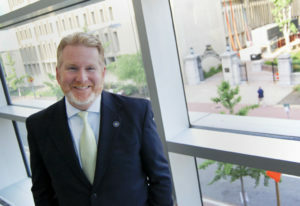 Joseph Cordes, who leads the Faculty Senate’s finance committee, said focusing on the $1 billion campaign and building excitement about the goal may keep the University from giving updates on how projects are progressing, especially if the fundraising total is lackluster. While the fundraising office is courting potential donors, they may “keep some things a bit under the radar” to protect those conversations, Cordes said. Officials have said landing a naming gift for the building will be critical. The University has historically struggled to secure naming gifts for halls, though that has recently started to change. The last naming gift was a $5 million donation from Board of Trustees member Mark Shenkman, which renamed Ivory Tower last spring. In March, $80 million from billionaire philanthropists Sumner Redstone and Michael Milken renamed the public health school. The GW School of Business, School of Nursing and Law School also need donors to become their namesakes. 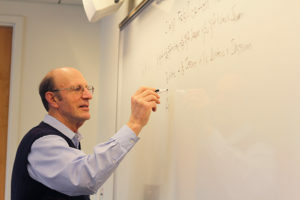 Anthony Yezer, an economics professor and former chair of the Faculty Senate’s finance committee, said it will be a challenge for officials to raise enough for the building without a “big chunk of money” for a naming gift. “Let’s hope the reason they’re not saying much is there is a whale out there that’s swimming up and down the tidal basin and the hook is in the water and there are negotiations,” Yezer said. Bringing in money for the building will become even more difficult once the construction is complete because donors might not believe there is urgency to the project, said Arthur Criscillis, a partner at the fundraising firm Alexander-Haas. But the lagging fundraising for the building is not because of a lack of effort in courting donors. Across the country, many donors choose programs over buildings, wanting to see their gifts play out in scholarships or professorships. Nationwide, the percentage of donations going to construction was just 8 percent in 2012, a four percentage point decrease from 2003. Donors may choose to make a gift because they believe in the institution, but most donate to teaching and research programs, said Richard Allen Ammons, a senior consultant at the arts and education fundraising firm Marts & Lundy. “While many donors value having their name on a building, donors primarily give because they want to have impact on student learning,” Ammons said. This article appeared in the October 27, 2014 issue of the Hatchet.